Ah, the flavor-packed, tangy, herby deliciousness of chimichurri. It’s enough to make one feel a little tingle at the sight of a huge fresh bunch of cilantro and garlic. 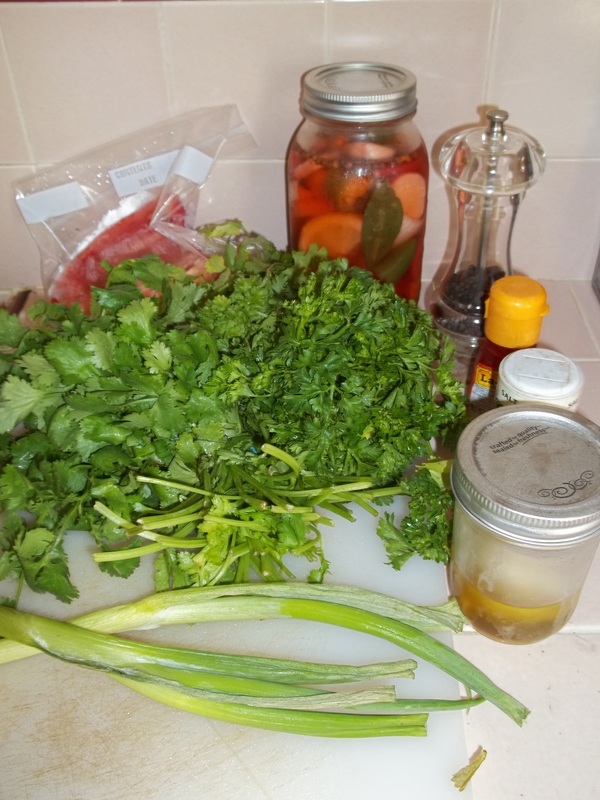 I used some of my own spicy pickled vegetables (garlic, jalapeno and onion) and smoked garlic to make it my own, in addition to cilantro, chives and red bell pepper. It’s extremely easy to whip it up in a food processor and either freeze for later use or use immediately on smoked or grilled meat. 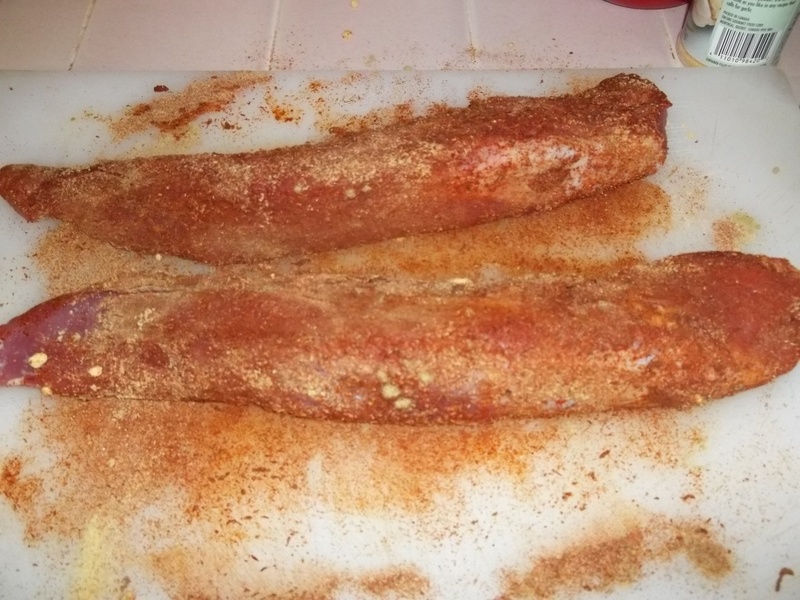 I used a simple dry rub of paprika, garlic powder, white pepper and thyme on two lovely pork tenderloins. I smoked the pork over apple wood chips for about three hours. Delish! This is the ultimate flavor addition to any meat, and it’s extremely easy to make. Place all ingredients in a food processor except vinegar and oil, and blend until the herbs are ground down. Stop motor and add vinegar, then slowly drizzle in the olive oil as the mixture is blended. Freeze for later use or use immediately as a fresh topping for smoked or grilled meat. 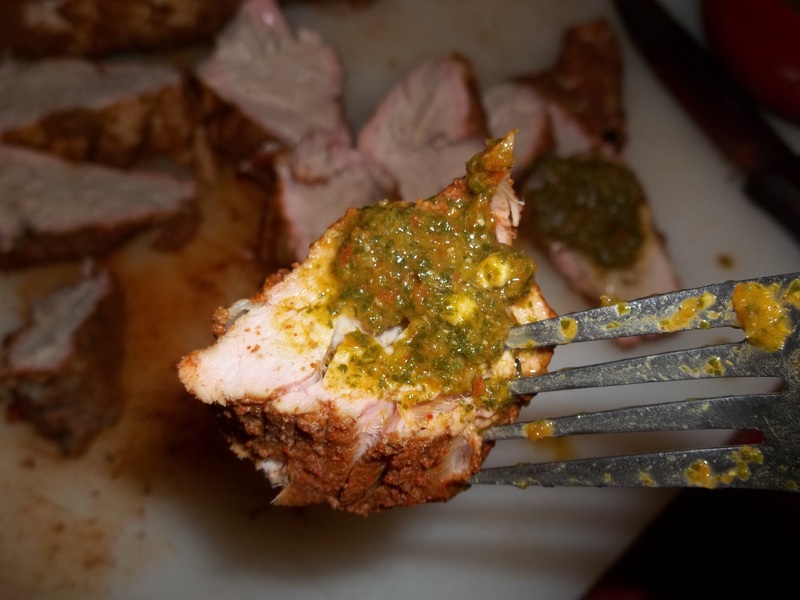 This entry was posted in cooking, food, Uncategorized and tagged chimichurri, chimichurri recipe, recipes with fresh herbs, smoked pork, topping for smoked meat, topping for smoked pork. Bookmark the permalink.